This past summer, members of Cary church of Christ had the privilege of joining a mission effort in Nicaragua. This trip took place as part of the Latin American Missions, overseen by the Forrest Park church of Christ in Valdosta, GA. Latin American Missions (LAM) is a multi-faceted mission effort to bring the Gospel to Latin America, primarily through Native Preacher Training. Cary church of Christ also partnered with LAM efforts in 2010, 2012, and 2014. Thank you to everyone who supported us and prayed for our mission effort to Nicaragua. We had a very successful trip and were blessed to be a part of it. We had 38 team members that consisted of several teens and adults. YES II Team in San Marcos, Nicaragua. Here is a brief summary of our work. We knocked 138 doors, made 315 contacts, 271 Bible studies, 12 baptisms (including 1 young lady in our group), and 1 wedding in the 6 days we worked. A second wedding is in the works. Ezekiel, a 14 year old young man, was the first baptism of the week. The newly weds wanted to be married, but couldn’t afford to, so they lived together and had a child. The team that worked with them taught them the truth and they wanted to get married before they were baptized. The team chipped in and paid for the necessary paperwork. We had the wedding followed by baptisms of the bride and groom. One of the houses in the community. Prayer during a Bible study. Nellie, with her two grandsons, making tortillas to sell. Eryn worked in VBS all week. Kaleigh, Angelina and I worked in the field holding Bible studies and helped out in VBS in the evenings. We worked on teams and I held two one on one studies with ladies. After morning class, the kids like to play in the street right in front of the building. VBS skit volunteers dressed as the Days of Creation. Thank you again. To God be the glory! If you want to find out more about how you can personally get involved with Latin American Missions, visit http://lam.forrestpark.org. Samrit Kammanee, a former speaker at our East Tennessee School of Preaching lectureship, has asked that we remember Janpen Buengumpan. Janpen is a 17 year old Buddist that has been attending worship with Samrit; Samrit has also begun studying the Bible with Janpen and asks that we remember Janpen in our prayers as the Lord’s Word is shared with her. Our congregation is thrilled to be supporting Tavaro Hanna, a preaching student attending the Memphis School of Preaching. Tavaro, his wife Alissa, and his two daughters Genesis and Legacy are from Grand Bahama in The Commonwealth of the Bahamas. For over twenty years, Tavaro has been active in the work of the Lord’s church in Freeport on Grand Bahama. After completing his studies at the Memphis School of Preaching, The Hanna Family plans to return to the Commonwealth of the Bahamas so that they may work full time to spread the gospel and grow the Lord’s church in the area. For more information about Tavaro, his family, and the good work he is doing, check out his personal website! Below is an excerpt from one of the India mission works we support, Church of Christ India Missions. I’ll be posting the entire newsletter on the Missions bulletin board this Sunday. This amazing growth is in part because the people of India are tired of Hindu dogma that has kept them peasants for generations! During the first 4 months of our efforts in 2014, our team conducted 104,000 Gospel meetings. 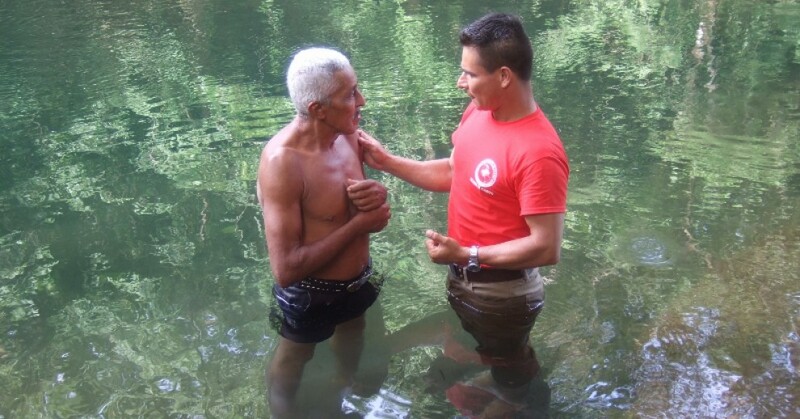 A total of 200,654 souls were baptized into Christ. Of that number, 771 denominational preachers. In addition, our team planted 2,890 new congregations of the Lord’s church. Overall, 706,000 souls were baptized. Through the months of April this year (2015), our team has conducted 133,288 Gospel meetings, leading to 263,727 souls to be born again. We established 4,769 new congregations- and a total of 1,593 denominational preachers have been baptized. Our goal is to baptize 750,000 this year. These are the young people enrolled in the two year Bible course taught at the Coimbatore Bible Institute, conducted on the Angie Greene Campus in the little town of Chettipalayam, S. India, who meet in separate classes for the two year study. For the last course in April each year they meet together and study the book of Revelation. This year there are 32 girls and 27 boys. Mercy Wilson, principal, in the blue and green sari sits next to her husband, Peter, in the front row at the right. Stan Perveen the principal for the men’s section stands on the left end of the second row of the young men. Bible classes each day are for four hours, but all students in their spare time study English, typing and computer applications. A local college awards them a certificate in computers. They also have an afternoon class to learn tailoring. Chettipalayam, where this school is located, is about 1,800 miles south of Assam. In the first few years of the Bible School in Chettipalayam the kitchen was located in a renovated cowshed. Later we were able to move it to an old house on the property, but it was very inadequate for the daily preparation of food for 140 or more students and staff. Not only so, but T. Samuel, who is manager and head cook currently lives off the school grounds with his family in a house we rent for him. As you can see from the picture we have torn down the old house and are building a new kitchen (ground floor) and an apartment for the family upstairs; plus a library room for the students’ use. Also on the ground floor next to the kitchen a small room is being provided for two women cooks who have no family. As a point of interest brother Samuel is one of the three elders in the church that meets on the property directly behind the new kitchen, where the orphans’ home is located. 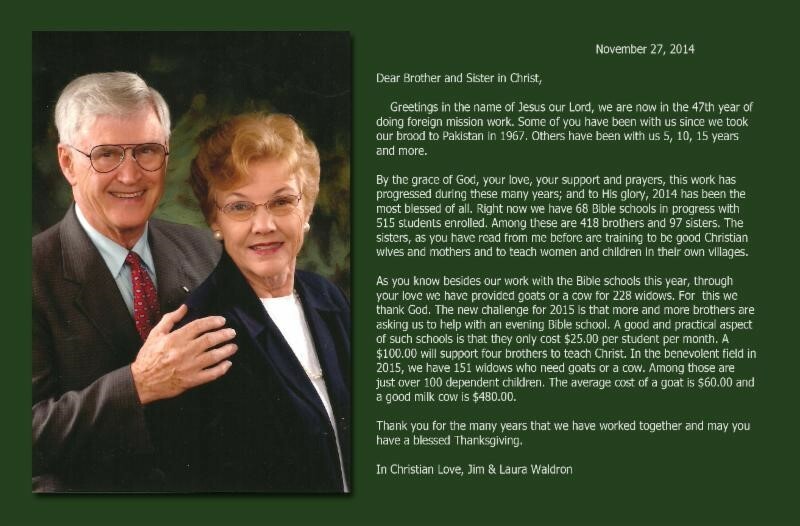 There are about 120 children in the home, which is a project of Don and Cathy Iverson begun in 2002. Fifteen of the children from the home are enrolled in the Bible School. We are extremely thankful to God, who has stirred up the hearts of so many of you that are helping this work to the extent that we can continue to develop it and prepare for more young people to be helped to glory. As I have written before there are seven states in the northeast of India where the people are nationally Indians, but ethically the majority is made up of Mongolian tribes, who speak many different languages. One of these languages is Karbi and the Karbi people have proven to be very open to the gospel, even to the point that two years ago we were able to spin off from the Northeast Bible Institute (NBI- English medium) a separate school known as the Karbi Bible Institute (KBI); using the Karbi tongue. The region where the Karbi tribe lives is in the central portion of the state of Assam about 110 miles from the state capital, Guwahati. The young evangelist, chosen to be the principal, whom you know of is Joysingh Enghi. This young man is only 24, but he has proven himself an effective evangelist, a defender of the faith and a fine Bible teacher and an effective trainer of others in the word. 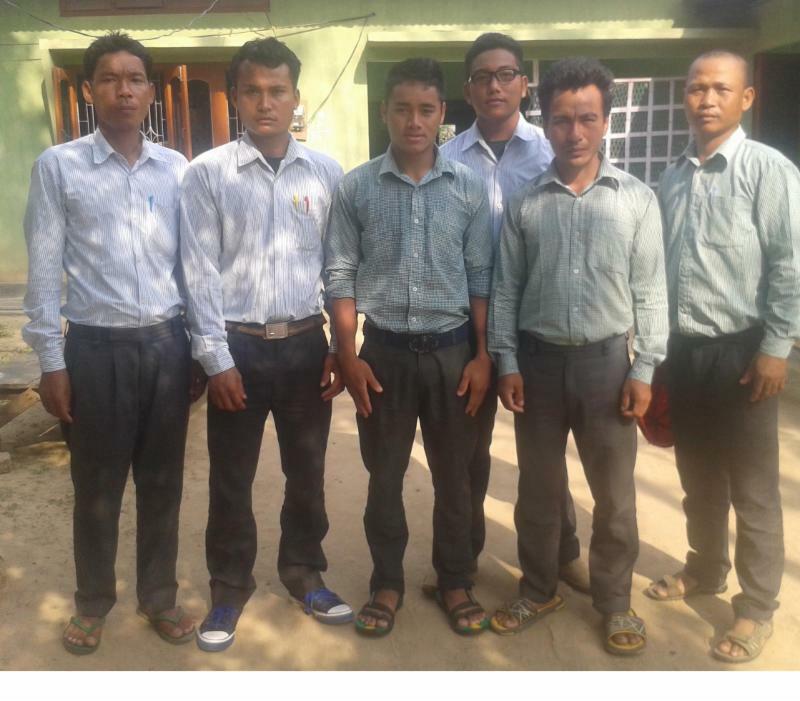 The school meets in a small town in the Karbi district, called, Diphu, about a hundred thirty miles north of where NBI meets south of the state capital. The six men shown above are expected to graduate on May 9, as the first graduating class. Lord willing I will be there for the graduation. The names Rongi and Engti are tribes. 1. Jowelson Rongi. This brother is 37, his wife’s name is Mili and they have two children. By trade he is a farmer and speaks four languages, 1) His own tongue, Karbi; 2) Assamese, the state language; 3) another tribal language, Naga; and 4) the national language, Hindi. 2. Malong Hanse, 22, he is unmarried. By trade he is a farmer and speaks five languages, 1) Karbi; 2) Assamese; 3) Naga; 4) Hindi; and 5) English. 3. Chondro Engti, is 38, and his wife’s name is Sika. They have two children; together they are in the broiler business. He speaks four languages, 1) Karbi; 2) Assamese; 3) Naga and 4) Hindi. 4. Anderson Engti, 23, unmarried. By trade he is a farmer and he speaks five languages, 1) Karbi; 2) Assamese; 3) Naga; 4) Hindi and 5) English. 5. 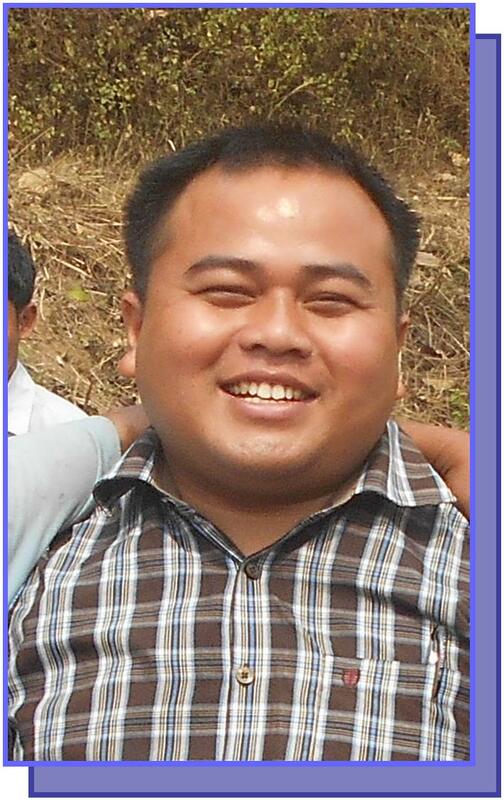 Mensing Engti, 47, his wife’s name is Melep and they have four children and three of them have already obeyed the gospel. He is a farmer and speaks four languages, 1) Karbi; 2) Assamese; 3) Naga; and Hindi. The name Engti is a tribal title. 6. Thomas Rongpi, 46, his wife’s name is Kabon and they have five children. He is a farmer and speaks five languages. 1) Karbi; 2) Assamese; 3) Naga; 4. Hindi; and 5) English. April 3, 2015 gathering of 57 of the 61 Gospel preachers in Chennai, the capital of Tamil Nadu. They conduct as many evening bible schools each week with 534 enrolled. These schools are located in two states in the deep south of India -Tamil Nadu and Andhra Pradesh. Classes are taught in the Tamil and Telegu languages. These classes meet three evenings a week for three hours for three years. The cost to maintain these schools is about $25 per person, not for wages, but for busfare and an evening meal of beans and rice. A contribution of $100 a month supports four of these brothers, many of them are already preaching each Lord’s Day. These five girls stood First in a 12-Hour writing of scriptures on February 14, 2015. They were all challenged to write as many scriptures as they could remember having learned over the period of their studies. The girls are named from left to right in the picture: 1. D.Sathiya: age 20 = 405 verses; 2. M. Chitra: age 21 = 461 verses; 3. A. Preethika: age 19 = 405 verses; 4. P. Mariyal: age 22 = 501 verses; 5. S. Mythili: age 17 = 527 verses. The group of 31 girls averaged 260 verses each. May the God of Heaven and earth be praised for raising up such young people who have the zeal to know the Word of God. Such girls have the potential as mothers and grandmothers to raise generations of Gospel preachers. After graduation here on May 2nd I will fly to the northeast to NBI at Guwahati, then the Karbi graduation, and on to another graduation in Aurnachal Pradesh. There are many other things to do, including a follow up on the request we received to provide for 60 orphans in the Karbi Hills. May the God of all comfort bless you for your love of His Son and His Kingdom. Please pray for the masses to hear.